Cualquier pregunta no contestada se marcará como incorrecta. Para enviar tus respuestas, haz click en el botón que encontrarás al final del test. A continuación verás tu resultado y la correspondencia de los niveles según el Marco Común Europeo de Referencia para las Lenguas. Resultado: %%SCORE%% puntos sobre %%TOTAL%%. Nivel: %%RATING%% del Marco Común Europeo de Referencia para las Lenguas (MCER). ¿Te apuntas a un curso? ¡Envíanos tus resultados ahora! Para algunos cursos hay que hacer la prueba de nivel online y enviarnos los resultados antes de matricularse. 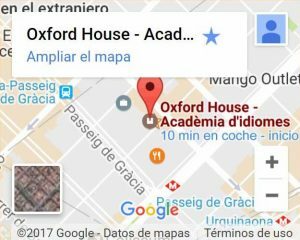 Completa este formulario y envía una copia de tus resultados para ti y para Oxford House. Envía tus resultados vía email. Finalidades: Responder a tus solicitudes y remitirte información comercial de nuestros nuevos cursos, promociones y descuentos, eventos e intercambios de idiomas y nuevos posts del blog para mejorar el idioma, inclusive por medios electrónicos. Derechos: Puedes retirar tu consentimiento en cualquier momento, así como acceder, rectificar, suprimir tus datos y demás derechos en info@oxfordhousebcn.com. Información Adicional: Puedes ampliar la información en el enlace de Aviso Legal. I have 25 years old. My brother is going to study in London. Can you tell me your email address? Would you like me to spell it? Do you like my telephone number? John almost ..... control of his motorbike because the road was so icy. Paul is worried that he'll ..... his driving test. Mary didn't come to work today- she ..... be ill.
Kate recently moved to India. It will take her some time to get used to the ..... of life there. From the top of the mountain you get a great ..... of the city. The students are ..... plans for their summer holidays. My sister ..... in London since she graduated from university. If you sleep more than eight hours a night you get fewer ..... illnesses like colds and the flu. Sarah passed the exam, ..... not studying. Are there any major differences ..... your new job and your old one? The police officer tried to ..... her from entering the building. The teacher called the boy's parents because he had been ..... from school. A Norwegian ..... of scientists claims to have discovered a cure for the flu. Anyone ..... the exam should bring a passport or driver's license for identification. If you're visiting the UK in March, I'd ..... you bring an umbrella. Those who object ..... the new policy should address their concerns to the manager. The students were told they should be ..... to work hard if they want to pass their exams. David is such a baby - he throws a ....whenever he doesn't get his way. She had to ..... the invitation due to work commitments. The actress is rumoured to have ..... cosmetic surgery.